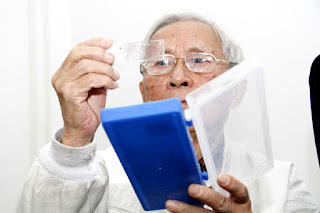 If Dr Zhou Xueliang says he is the most experienced forensic anthropologist in Jiangsu's provincial capital of Nanjing, no one will dispute that. Although he retired 24 years ago, the 90-year-old still goes to work every day by bus. He has a lab in the Forensic Identification Center under Nanjing Medical University. The lab is piled high with books and materials. On his desk sits a microscope that has helped him anatomize more than 1,000 bodies. "I recognize more dead people than living ones," Zhou says with a smile. It wasn't Zhou's first choice to be a forensic anthropologist. He entered medical school in 1946 to achieve his aspiration of becoming a doctor. But when he graduated in 1951, the university asked him to become a forensic assistant. "I chose to study in a medical school to solve the problems of living people, not to spend time with the dead," Zhou says. But after some consideration, he agreed to accept the university's offer and worked hard to overcome his fear. When he was an undergraduate, Zhou sometimes went looking for unidentified bodies in abandoned areas together with some male classmates. "I've seen all types of corpses died of various reasons," Zhou says. "The most horrible bodies are those who died of drowning, with terribly swollen faces and stomachs." Dissecting bodies is his core job. "Take the human brain, for example. The brain is as soft as fresh tofu, and thus, it's hard to cut. We need to add formaldehyde so that it will stiffen. "But the career requires us to overcome our fears, and we got used to the bodies after awhile," Zhou says. "My nose is not sensitive to the smell of decomposed bodies now." The man says his job is like a detective's. "A forensic anthropologist needs to combine professional knowledge with reality, such as the victim's health condition, the family background and the social network, to consolidate the conclusion of the anatomy."